Initially Yours offers you many ways to shop our items! We accept Paypal, checks, cash and all major credit cards. Shop online at www.initiallyyoursandmore.com and add items to your shopping cart. Easily checkout to make quick and secure payment through Paypal. 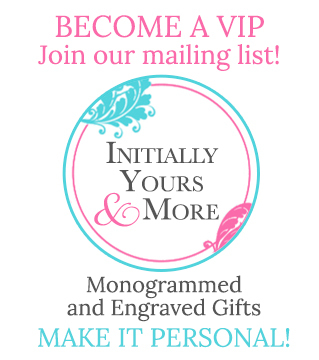 Email me your order to jolene@initiallyyoursandmore.com and I can send you a PayPal invoice to pay with! We ship USPS. Items usually ship in just 1-5 business days personalized to you!